Woad (isatis tinctoria) blooms early, tall stalks with lots of tiny yellow flowers. It’s a biennial plant. The best colour comes from first year leaves. Woad was used for centuries in Europe and the Middle East to get a light-fast blue. The introduction of more efficient indigo plants from Eastern Asia spurred bans in 16th century France and Germany, to protect the lucrative woad industry. The leaves are soaked and strained, the water made alkaline and aerated. The pigment is reduced, giving a bath with hints of blue in the foam. The blue magically appears after the cotton is taken out of the vat and exposed to the air. 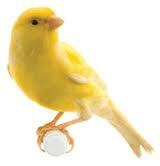 All Canary clothes can be machine washed and dried, in any temperature. Fabrics are always pre-washed, ensuring no surprise shrinkage. Nothing requires dry-cleaning. Just water and the most eco-friendly soap you can find. Because the fabrics are organic, and Canary-tested, they do not contain formaldehyde or other harsh chemicals and permanent resins typically used on non-organic clothing. Pictures and posts about Canary products, events, organic fabrics, textile and garment industry issues and more. Orders can be made via the CanaryShop on Etsy.